NCR continuous sets are typically used for invoices and are typically printed on daisy wheel inkjet printers. Printit4u can print Sage and Pegasus compatible invoice sets with your name and logo printed on each set. Our in house graphic studio will exactly copy your proprietary invoices to ensure that your invoices look exactly as they did on your proprietary stationery or we can print bespoke continous sets with your exact company pantone colours and print your company name and logos in the correct fonts. 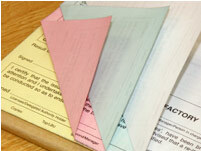 NCR Sets are simply pages of carbonless forms that are tipped glued together. Duplicate sets have two pieces of paper and triplicates contain three pieces of paper. 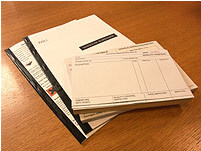 Many organisations print their invoices on ncr sets so that the customer can be given a copy and the back copies are retained as permanent office records. Printit4u offer a nationwide service and specialise in the ncr printing of multi-part loose sets in loose set format for laser printers and continuous format for daisy wheel printers. Our continous sets have perforated sprockets on either side and are compatible with all leading brands such as Sage and Pegasus. Using specialist web machinery we can produce large runs cheaply for any size of sets, and if required, we can sequentially number the invoices. We have fast turn around times, the lowest prices, and the best quality NCR printing. Please complete the following form and press submit for your fast no obligation online quote. 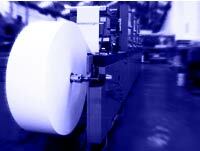 Trade printing enquiries for your ncr sets are welcome.